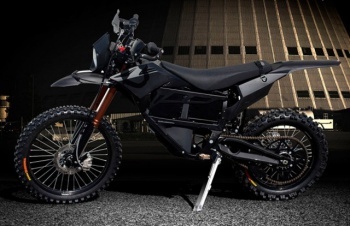 With DARPA's newly-commissioned stealth dirt bikes, the enemy will never hear how rad you are. The US pours a lot of money into military research, and the government's Defense Advanced Research Projects Agency (DARPA) uses those funds to provide superior technology like drones, advanced software, and the best dirt bikes on the battlefield. Possibly the only dirt bikes on the battlefield, but still the best. A newly commissioned project will equip US special forces with hybrid, all-terrain bikes that don't sound like an earthquake on wheels. The DARPA-issued grant goes to BRD Motorcycles, who will incorporate a specially-designed engine from Logos Technologies. "Quieted, all-wheel-drive capability at extended range in a lightweight, rugged, single-track vehicle could support the successful operations of U.S. expeditionary and special forces in extreme terrain conditions and contested environments," says Logos manager of advanced concepts Wade Pulliam. "With a growing need to operate small units far from logistical support, the military may increasingly rely on adaptable, efficient technologies like this hybrid-electric motorcycle." All silliness aside, there are definitely plenty of uses for small, quiet transport like this in a warzone. With luck, we could see a variant of the stealth engine make its way to commercial bikes - sure, it can't be nearly as satisfying as the purr of a modern motorcycle, but everyone around you would probably appreciate the quiet. It is kind of strange that bikes have never really been a common military thing, especially when it comes to scouting. But I always assumed it was the helmet thing, because the designs of helmets for both kind of conflict, you don't want a helmet that blocks peripheral vision in a war zone and you want a shock absorbing helmet that will stop you from breaking you neck if you have an accident on a bike. And changing helmets in the middle of war zone is never a great idea. Since modern combat helmets are already designed for shock absorption, it makes a dirt bike helmet rather useless. I'm kinda doubting helmet technology would have held back the implementation of dirt bikes in the field. I am assuming that dirt bikes aren't used often is because they're extremely prone to breaking down. If you got sandy terrain, it's twice as bad. And there's also the problem of a loud bike blatantly giving away your position or singling you out. But, if you got a quiet, stealth bike that you could ditch halfway through a mission, it's probably a decent form of transportation. They actually used to, at least in Europe. I know the German army still has so called Kradmelder units, but in days of encrypted wireless communication, they're sorta insignificant. Scouts use quads nowadays, no sure if dirt bikes would have any advantages over those. In related news, DARPA is now radical. U.S. Army Calvary Scouts actually use the Bradley Calvery Fighting Vehicle [just like the Infantry Fighting Vehicle, but has room for Anti Tank Rockets instead of 8-12 soldiers], the standard MRIV, or the best form of transportation thus far, their feet. and while it is nice not being heard, you would be surprised just how easily it is for a Bradley to sneak up on people. Hell, the Stryker is pretty damn quiet as well. This would mainly be used for S.F. operations though, quick insertion and ex-filtration namely. Scouting requires you to stay put for a while which wouldn't be helped by having small vehicles since you pretty much bring all your equipment with you, drop it off at a safe area, and then continue on objective with what you actually need. Seems like a waste of money. Then again, the modern day enemy that the U.S currently faces might as well be a Neanderthal. If the U.S don't pick on anyone their own size any time soon then we'll be seeing investments where coffee can be drank without raising a decibel. The thing people forget is some of the R and D that goes into military and NASA projects eventually makes it back to civilian technology. This and moving towards other electric military vehicles might encourage many companies to work better and more efficient battery and electric motor tech. It might even give a boost to super capacitor research, so we won't be walking around with 2 or three lithium fire starters in our pockets sooner than scientists predicted. Maybe this thing's hybrid technology can make hybrid cars actually better for the environment than the currently better design traditional gasoline cars out there right now. Plus since this for special forces roles, I doubt the military would order too many at once, as long as the stupid politicians don't get involved. And DARPA probably has a contract with the supplier to allow them to produce a cheaper civilian model, that I'm sure dirt bikers and trail riders will pick up, giving the suppliers more revenue streams. I'm pretty sure civilians speculating on military development is like, penguins speculating on Quantum Physics. Though it is fun to talk about stuff like this. It does make for some...interesting...jumping through hoops when it comes to the "writing" of modern military shooters and trying to portray the US military in a vulnerable and/or sympathetic light. That said I had heard about a military motorcycle a few years ago (don't know the outcome of the project) that impressed me more than this one. That project featured a cycle whose engine that could run on basically any combustible fluid. Wait, isn't this basically all of what DARPA does? Crazy mil-tech? That and making appearances in Metal Gear Solid, yes. I think you're referring to the Hayes Diversified Technology (HDT) M1030M1, which can run on diesel, JP8 (aviation fuel type), and biodiesel. Unsurprisingly, several hundred of this motorcycle have been ordered by the USMC. Unfortunately, I think the only type of engine that can burn almost anything combustible is still the gas turbine, of which one type is used in the M1 Abrams. From what I understand, when it came to the original Abrams design, crews would idle the engine at high RPMs for responsiveness in battle, meaning it still burned a significant amount of fuel even when standing still. Fuel consumption was also an issue at slow speeds, but they've added different systems to raise the efficiency, which still wasn't much. The thing people forget is some of the R and D that goes into military and NASA projects eventually makes it back to civilian technology. Well, simply put my point was there are better things that you can invest in. That said, this isn't really a new stand point on technology. This, THIS!, all this is, is the U.S army implementing technology which the civilian sector has been developing and investing for a few years now in the US, in the UK and in most of bloody Europe all to appease the UN CO2 targets. Any military forces with 2000ish technology don't rely on sound given the boom on imaginary technology, even my local street and even my small pitiful town has tech to see in the dark. Even if it was just for special forces roles I'm guess it's gonna have to be some pretty run-down/rural country. Can you seriously, with a straight face tell me where and how this thing could be put to good use? With all that said again, it's still a very early developing technology and the main contributors into this factor will be local people, local and national companies but not militaries blasting their budget on equipment that will never see the light of day. The conversion from carbon to greener technology will happen from smaller day-to-day choices. What's been created is technology for enthusiasts and I bet you those enthusiasts are fairly nostalgic about their motorbikes. Just to screw with your point that there are such as things a car/motorbike being too quite in the public and as such most hybrid/electric cars artificiality replicate the sound of a motor engine because it can actually be a danger in itself as people tend hear a car before they see it especially when we're dealing with the possibility of blind people being around. As a result it could lead to a law against silent/low sounding vehicles. Was this worth all the millions of presumable dollars spent for R&D? I think not. Pht! What good will all of that fancy tech do you when the zombies invade? Nothing! Real marines ride bikes, preferably with pink tassels! This bodacious trickster is all you need to stealth behind enemy line and save the hostages! Oh NO! Baron Steelclaw is forcing Dr. Luscious to build the Ultimate Mega Bomb! Quick! Use your mounted rocket gun to save. the. day! That's pretty neat, I wish the guys who ride dirt bikes outside my home could get these. They aren't common, but they are there. The SAS uses bikes and quad bikes, for example. Back in the day, lots of forces used bicycles to get around. For those who have ridden motorcycles or dirt bikes you know they take a fair degree of concentration at the best of times. I don't see that working out very well while being shot at. Plus any sort of riding off road/trail requires a very high degree of training and practice, and the risk for injury in even a low speed crash is still on the high side. That being said the US marines have been using modified KLR650s for at least a decade and some one already mentioned the ones that run on JP8 (with are also KLR650 just with a different engine). Not sure for what though as most of our recon is done by drone nowadays. not really, a drone can give a base idea on what's on the ground moving, but you get better recon with actual eyes in the area. not to mention the recon groups the U.S. has have some pretty impressive tools they use. A drone might see 18 or so people moving west near a wood line, but a Scout squad can tell you any insignias, give a definite count and ID of weapons they might have and even ethnicity of targets. Even better, they can get close enough to them to relay the targets actual plans directly back to the chain of command and be actionable ready within moments of confirmation by higher ups. A drone might not have assets to deal with situations, it could be un-armed and just in a pure recon mode when it sees a group of light armor moving in. A Cav Scout squad will not only see them, but be able to directly engage if needed. Sounds like a good vehicle to send special forces into rocky hills to hunt an enemy hiding out there, only reachable by mule paths or by very bad roads mined with IEDs. So a quiet dirt bike would mean they can approach faster and with lower risk of detection and have a smaller risk of being blown up on the way there because likely positions can be avoided by going off-road. I don't know if that'll still be a likely scenario for future US military campaigns but it surely was in the past decade. They probably already have likely candidates for "interventions" in mind and plan their equipment and vehicles accordingly. Pff, wake me up when special forces skateboard to the battlefield. In other news, DARPA is working on turning our forces into the Brotherhood of NOD. Heh, if Dr. McNinja had this instead of the one he had, he'd get Rad without getting bad in the process. DARPA is the Pentagon "Mad Science" division, responsible for things like developing drones and creating remote-controlled cockroaches (seriously). "Quieted, all-wheel-drive capability at extended range in a lightweight, rugged, single-track vehicle could support the successful operations of U.S. expeditionary and special forces in extreme terrain conditions and contested environments,"
I'm confused. How exactly do you make a motorocycle "all-wheel-drive" capable? Seems like driving the front wheel would make it difficult to also turn. So are they basically re-designing the batman motorcycle thing? If so, that seems wildly impractical. I'm just going to say, that one of the reasons you have a loud motorcycle is so that people can hear you. Not to be an obnoxious douchebag or anything, but because bikes are so much harder to see and notice because of their relative smaller size on the road. Head on, a lot of bikes have a profile no bigger (and sometimes smaller) than a standing pedestrian. I've had people pull out of intersection right in front of me (which is one of the biggest dangers and causes of death and injury on bikes), and I've had people try to merge into my lane right into me. Being as loud as you can is one thing you can do to help others realize that you are there. It's why I took the baffles out of the exhaust on my bike. It's still quite enough to put through the neighborhood without disturbing anyone, but at speed it can make some noise when I need it to. The Swedish army still uses bikes for despatch riders and recon, training includes going well and truly off-road in forests. i think your underestimating just how good cameras and video recognition technology has got. Google ran automated face blurring in its whole google maps system and i am yet to see where it missed one. same for car numbers, because of overzealous privacy laws here. insignias can be automatically identified and then relied to human operator for further processing. heck, humans look at the footage anyway in such case. where the problem comes in at is resolution of said pictures. trust me, I know how good the Military tech is, trained on a couple of systems that could tell which pocket you keep your keys in at 5-9 km away. the trade off is with drone recon is if you have anyone in the area. as I said before, a drone can tell you the basics, but an actual recon team can give you specifics. I just dont see Scout Squads jumping on dirt bikes any time soon. I just don't see Scout Squads jumping on dirt bikes any time soon. I concur, unless we're talking about those sweet hover-bikes like in Saints Row:The Third.